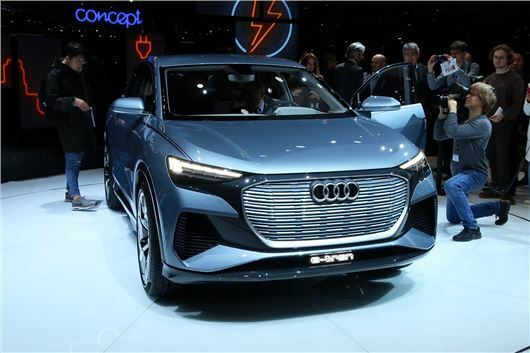 Audi has revealed its new Q4 e-tron electric SUV ahead of it going on sale with a 279-mile range in 2020. Although prices are yet to be announced, it'll be more affordable than the firm's e-tron, which we drove late last year and is now on sale in the UK. The Q4 e-tron is still a concept car, but it provides a very clear idea of what the production model will look like when it arrives next year. As you'd expect from the name, it sits between the Q3 and Q5 in terms of size, with a large Audi singleframe grille dominating the front end. Note the conventional door mirrors, rather than the cameras used on the e-tron. The Solar Sky blue paint used on the concept reflects a shot-wave fraction of sunlight, reducing the build-up of heat on the surface of the body and the interior significantly, says Audi. This improves the temperature of the interior and reduces the need for energy-sapping climate control. Inside is typical Audi: a very premium feel with a large infotainment screen and very few buttons. There's a virtual cockpit in place of dials behind the steering wheel, while a practical stowage compartment can be found between the front seats. There are two electric motors - one powering each axle - with an electric control distributing torque in place of a mechanical connection. In normal conditions, the power is sent to the rear. The car can predict when the rear tyres might be overwhelmed - such as in slippery conditions - and send power to the front. Batteries are located underneath the floor, providing a lower centre of gravity and a range of more than 279 miles. It can be charged up to 80 per cent in around 30 minutes. The Q4 e-tron will be available to order late in 2020, priced below the £71,490 e-tron.